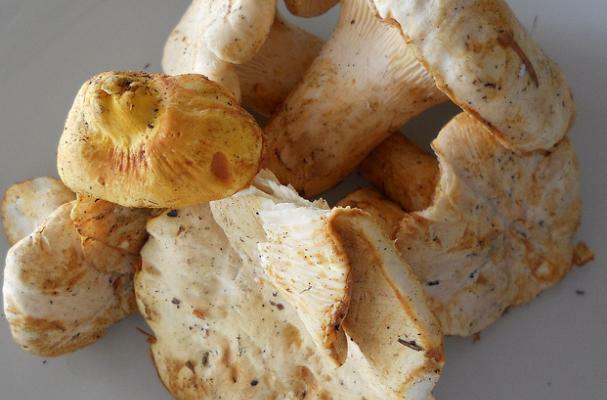 Foodista | Mushrooms: To Wash or Not? I picked up these lovely chanterelles at my farmers market today; luckily they are pretty clean already. When there is more dirt involved I have no problem running them under water, but I know for some this is blasphemy. Alton Brown did a bit of debunking about how much water mushrooms absorb, but the opposition is strong and well-organized. Mushroom brush, anybody? Wash? Brush? Rinse? Dab? Penny for your thoughts? I always wash them, even if they are in the same conditions as those of the photos. At the very least, I pass them very quickly under cold water and dry them immediately after with a dry cloth. I don't care how much water they absorb: even if you buy those at a farmers market, you have no idea where they have been. And where they have grown. I always wash my mushrooms because I'm afraid of the pesticides on them! But I always blot them dry afterwards. And if I'm cooking them, all the water will cook out anyway so it doesn't matter if they absorb a little extra. Wash, always. I never know what's on them or how much dust they may have gathered on their way to the market shelves! Unless I'm growing them myself and know exactly what's on them... wash! I usually clean them with a damp cloth (and yes, the cloth is black after!). I wash very quickly and I make sure to put it somewhere it can drain. When I used to work in a restaurant, someone would wash, cut, and then put the mushrooms into a container. It didn't matter how long I tried to cook off the liquid, the mushrooms always remained slimy. Ick!!! I'm really surprised how many people came out on the side of washing. I imagine all these restaurant chefs becoming apoplectic if you didn't use a mushroom brush. You'd be lucky to get out of the kitchen with both your thumbs! I totally washed mine under water at full-blast and shook them dry. There was a lot of liquid in the pan but they ended up tasting great. I wonder if you rinsed them, tossed them in oil, and broiled them on a rack how that would work? Can this be done? I'd try with some mushrooms a little less pricey in case the result was grim. I usually used a dampened kitchen towel and do a gentle brush off. Jacques Pepin, who of course has got to be one of the most prominent chefs in the world, has washed his mushrooms on his show. He stresses that it must be done at the last minute. When my dad would take me hunting for morels in the spring, we would soak the whole mushrooms in salt water for half an hour so insects would be expelled. It really worked and they tasted fine. Maybe the each mushroom type needs to be treated differently.